I don’t even want to know how many of you were on my case about this book. A lot of you were, that’s for sure! I knew I wanted to read Stalking Jack the Ripper – if only because London and I are a perfect combination. So sorry it took me this ridiculously long to pick it up, guys! I was expecting to get that real eighties, London vibe and that’s exactly what I lost myself in. I loved it. Kerri Maniscalco simply transports you back to the era of Jack the Ripper, with all its gruesome gore and spooky atmosphere. Then we have our characters! Audrey Rose is, without a doubt, one fun, feminist, courageous and passionate character. I couldn’t help but admire the way she stood up for the things she wants, the achievements she’s working for, the freedom she’s trying to claim for herself. She knows what place she’s supposed to have in society, but she also realizes she deserves more than “simply being a pretty face and talking gossip” and not having an opinion of her own. She lives for quenching her curiosity – which is definitely something I can relate to as well, haha. Thomas, on the other hand, is quite the odd duck. He’s funny – that’s a given – and unique. The way he handles people and events is a prime example of that. His deduction skills are amazing. At first I thought they were a bit over the top, but it didn’t take me long to get used to it and understand someone can actually be that observant. Honestly, I can totally imagine Thomas being some nutty professor later in life – one awkward around people, but simply brilliant when surrounded with science. Yup. Definitely! Overall there aren’t really any creepy vibes – which I’m totally okay with. The descriptions Maniscalco throws at us, on the other hand, those are definitely worth mentioning. Gruesome to say the least. It freaked me out at times but I loved it. You simply cannot have a story revolving around Jack the Ripper and not have the gore that goes with it. I know there’s supposed to be a spark between Audrey Rose and Thomas but… Honestly, I couldn’t feel it. Sure, they had some fun banter going on, but that’s where it ended for me? I don’t know. Honestly, I think this is totally me and others might not feel the same way about this. Overall this is definitely an enjoyable read! The gory details had me freaked, the story had me hooked and Audrey Rose had me cheering her on. Can’t wait to get started on Hunting Prince Dracula, to be honest! 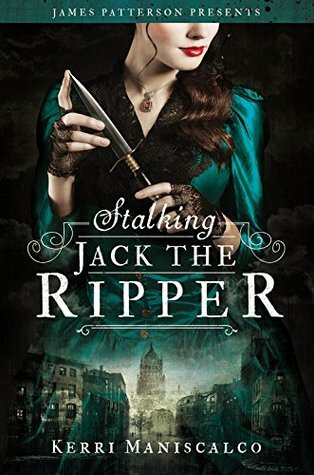 Have you read Stalking Jack the Ripper yet? Or maybe even read Hunting Prince Dracula already? Which one did you like most? Why are you or aren’t you planning on reading these books? Really great Review! I’ve recently read this too and loved the setting + Audrey Rose, it’s impossible not to like her and I loved how she stood up for herself 😍 I have to admit that it did take me a bit longer to warm up to her and Thomas, so we’ll see how their relationship develops in the next book. Haha, exactly. She’s simply a smartass who gets away with it. Which makes the whole thing even more brilliant, really. I had the same with her and Thomas! Someone told me it got way better in Hunting Prince Dracula though, so I’m keeping my fingers crossed for the feels and chemistry. I honestly didn’t really feel the chemistry between the two all that much so I’m hoping that’ll change in the second book. People told me they felt it was better in HPD, so I’m keeping my fingers crossed for feeling the same way about it, haha. Right?! She’s definitely a wiseass, haha! Okay, I’m keeping my fingers crossed I’ll feel the same way by the time I finish HPD because I do want to lose myself in the chemistry. I DO. Hunting Prince Dracula is even better, I hope you enjoy it just as much! Oh, awesome to know! Thank you! I love this series! I can’t wait for the third book to come out!!!! It’s such a fun series. I’ve yet to read Hunting Prince Dracula but I’m definitely curious about it! And Houdini?! That sounds awesome, haha! omg i fn love kerri maniscalco’s books! And just wait until Hunting Prince Dracula for the sexual tension between AR and Thomas to heat TF up! As you know I’ve read both Stalking Jack the Ripper and Hunting Prince Dracula and lives both of them. I rated both 5 stars but HPD is probably my favorite. So glad you finally read it and loved it. I hope you love it as well.